The World Mining Congress is an international event that takes place every three years. It is led by a secretariat and affiliated with the United Nations. This year’s event took place in Rio de Janeiro, Brazil from October 18 – 21. The event aims to promote and support, both technically and scientifically, the cooperation for the national and international development of mineral areas and resources; implement a global information network concerning mineral science, technology, economy, occupational health and safety and environmental protection. Fr. Seamus Finn, OMI, spoke on the Kellogg Innovation Network (KIN) panel, Why Partnering For Development is the Future of Mining. The panel explored the social, economic and environmental dimensions that are so vital for a vibrant mining industry and a future that provides for an equitable distribution of benefits to all stakeholders. The church’s engagement with the mining sector and specifically with the Development Partner Initiative was initiated and motivated by three different factors. We have been blessed with a charismatic and disruptive pope who is responsible for the preparation of the encyclical Laudato Sí where we are presented with an inspiring vision of the interdependence and inter-relatedness that exists between all living beings and our common home, planet earth that builds on the teaching of his predecessors and of Catholic Social Teaching (CST). We are also called to task by Pope Francis for the ways in which we have failed to care for, cultivate and appreciate the gift of the natural world and instead mistreated the planet and failed as a consequence in our inter-generational responsibility to our children’s children. There are chapels and churches and houses of worship scattered across the world and especially in the remote regions where many of the mines and other desirable natural resources like oil, gas and timber are located. Faith leaders at different levels have for years been hearing from many of the people that live in these regions and many of the stories that they tell about their experiences of mining are not very positive. Many of the contributions that the industry has made to progress and development have been lost. The churches own and manage assets to support their various initiatives and they are shareholders in many companies that are active in the mining sector. They want to make those investments in industries and companies that are responsible and make a constructive contribution to the communities and societies where they operate. They also want to avoid investing in corporations that have a poor record on protecting the environment, in respecting and promoting human rights and in fulfilling their social license to operate. 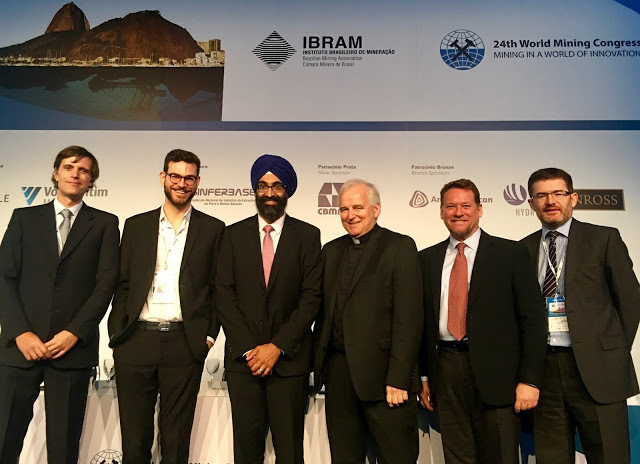 Three themes that are central to the mission of the church and of most faith traditions where the mission of the faith traditions and the mining industry intersect are promoting sustainable development, caring for our common home and protecting human rights. Promoting development has been on the agenda of the church for centuries and has been specifically highlighted by global institutions like the United Nations from the beginning. In recent decades the much debated adjective “sustainable” has been added to the conversation as the accomplishments and the failures of various development projects and programs have been critiqued and evaluated. A significant intervention into the development debate was made by Pope Paul VI in 1967 the encyclical Populorum Progressio when he called for the promotion of “integral human development” and sought to include much more than having more or simply measuring development in purely economic terms. The mining industry has often been a part of many development initiatives through their contributions to local communities especially in regions surrounding their operating sites and in communities that are impacted by the operations of their supply chain. In his encyclical Laudato Sí, Pope Francis has called all of us to care for our common home, Mother Earth that he points out has been critically damaged by much of human activity especially in the industrial age. He is quick to point out that there is no quick solution to the ecological crisis that we face but that each of us individuals and communities, institutions and organizations, the public and the private sector have a responsibility and a role to play in reversing these trends. The protection and promotion of human rights and human dignity are at the center of the church’s mission and enshrined in international law. They are more and more being encoded in legislation and being voluntarily embraced by different actors in the business community and particularly by stakeholders and shareholders in publicly traded corporations. Faith institutions and socially responsible institutions and individual investors that are working diligently to align the ways in which they manage these assets with their faith traditions and with their values are using this same lens to choose the companies and the industry sectors that they want to invest in. In the Days of Reflection that were convened at the Vatican and at Lambeth palace, in the Days of Courageous conversation that were convened in Cape town and in the other convenings that have brought together faith and industry leaders, civil society and representatives of local communities, we have a model that can help to address some of the challenges that are faced by local communities, industry and those who want to support sustainable development. The commitment to care for and cultivate and protect our common home must be our number one priority. We cannot rest until we have found the avenues and the technology to do this and at the same time use the multiple and rich resources that are before us to support human habitation on the planet.